Where can I watch the race ?  Like each year, the “Fédération Française des Motards en Colère” organize its « Relais Motards Calmos » on the road to the Enduropale. Free services or at a biker price : awareness, mechanical workshop, cleaning of the visors, hot drinks, etc. Localisation : Salle l’Europarcquoise, departmental road 939. Le Parcq is 17,5 KM after Saint-Pol-sur-Ternoise and 48 KM before Le Touquet. Free services: cleaning of the visors, greasing of the chains , potential little repairs, checking of the wheels, food, coffee break. Free services : cleaning of the visors, greasing of the chains , potential little repairs, checking of the wheels, food, coffee break. On SANEF motorway for free. du Touquet Pas-de-Calais / Quaduro. 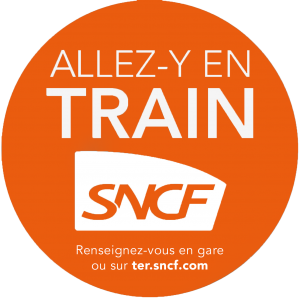 Tickets are sold on SNCF website and application for journeys made on the Hauts-de-France territory. Except for TGV and Intercités. A charged parking * with a capacity of 1500 cars is at your disposal at the airport (a service of free buses will take you from the airport to the town centre from 8am to 8pm). * unattended car park opened on Sunday from 7am. The tow is not responsible for theft and vandalism. Do not let anything visible inside your car. Make sure your car is well closed. It is forbidden for vehicles and campervans to park on Boulevard Thierry Sabine, booked for the rider’s areas Juniors and Espoirs. Parking also forbidden Boulevard Jules Pouget and Boulevard de la Plage. The access for the public, four-wheeler and motorbikes to the dunes is strictly forbidden. Regarding the four-wheelers and motorbikes, any transgressor to this regulation will be forbidden to ride for two years. He also puts himself at risk of penal sanction. 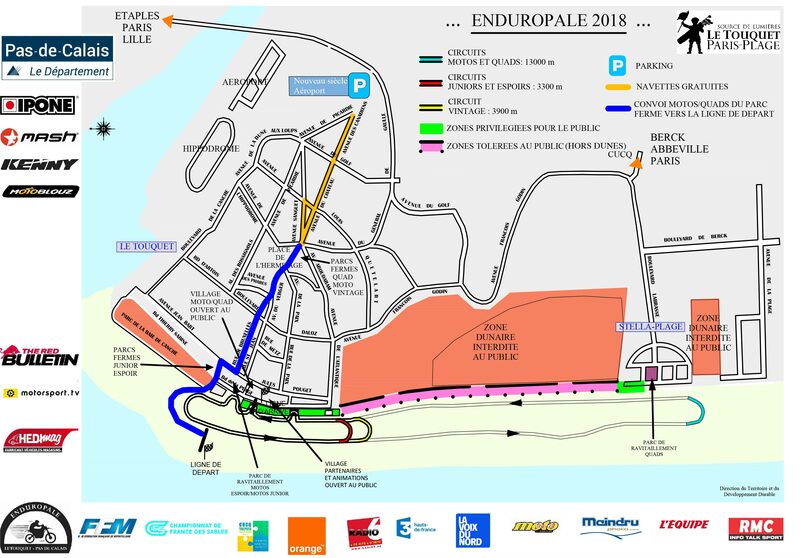 Some tunnels on Le Touquet-Paris-Plage beach will help you to access to the track in the direction indicated on the signs. Since 2006, the Enduropale avoids entirely the dunes, all the trials are on the beach. This sport event is located near sensitive areas and sites « Natura 2000 ». Some important studies were leaded on the evaluation of the impact by way of «Natura 2000 ». These studies ended there is no noteworthy negative effect. Every year, the article 15 of the prefectoral decree authorizing the event plans a communication through an information document in order to raise awareness among the public to the patrimonial interest of the dunes. This document indicates the strict protection of the dunes for all the spectators during the whole weekend. It reminds also the strict ban on motor vehicles inside the dunes and on the beach at anytime of the year, and finally, apart from the safety rules, this document advises the spectators on the different accesses to the sea front. The town of Le Touquet also proceeds, every year, in the form of a photo inventory, to an assessment of the efficiency of the measures taken to protect the site. An assessment of the restoration of the “pannes humides” is also provided to the file requesting the authorization and explains in details the works made by the municipal employees inside the natural area. These operations are made in dialogue and under the control of the “Conservatoire Botanique National de Bailleul”. All these measures lead the Regional Direction of the Environment, arrangement and accommodation (DREAL) to emit a positive decision to the organization of this sport trial.